Nigel rather rugged up in cold weather! 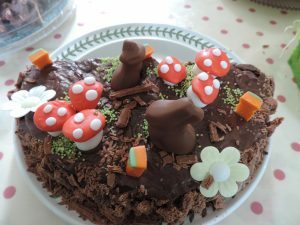 Jo and Kath's cakes in the Hartland Abbey tearoom are to die for - this is Easter! Thank you to everyone who supported us in 2018. We hope to welcome you back this year. 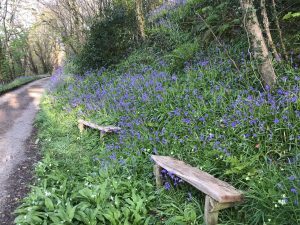 We have lots of exciting events to look forward to, starting with Bluebell Sunday on the 14th, followed by Easter Egg Hunts on Easter Sunday and Monday. Outdoor theatre will be back on the lawn from June onwards with some exciting shows. The winter has gone so fast and it is lovely to see our team of wonderful house stewards back again – we miss them all when we are closed! 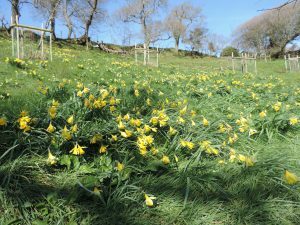 We held Daffodil Sunday on 17th March when the sun shone and lots of lovely Daffodillers came; there was still a good display despite earlier, awful gales and the early daffs being over. 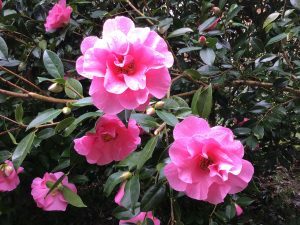 The camellias have been stunning this year; our beautiful collection is thanks to previous generations planting prolifically. 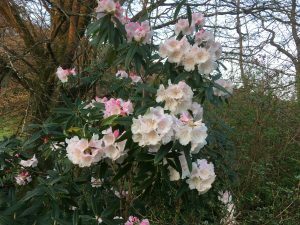 So much is out now – magnolias, the tree rhododendrons, camellias, tulips, bluebells, primroses, violets, wild garlic, chinodoxia and azaleas. Oh, they are all so early! Since closing in October so much has happened. We went straight up to Dumfriesshire to visit our youngest daughter, her husband and family for a break after a long season of welcoming wonderful visitors to the Abbey. 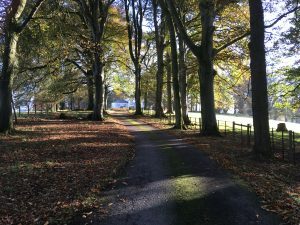 They run a lovely B and B just north of the Border, Knockhill House, and had a busy season too so it was lovely to be able to relax together. Christmas was a lovely family time but it always brings back a little bit of sadness too, remembering those we love but see no longer. 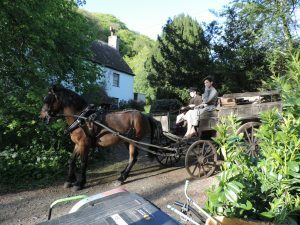 The BBC returned to the Hartland Abbey estate in November to film ‘Gold Digger’, a new series due to be screened soon. Starring Julia Ormond and Ben Barnes, it certainly looks gripping! 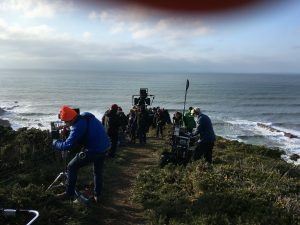 Location manager, Nick Marshall, found the Berry Cliffs as the perfect location for some rather nerve wracking scenes! The same location was used by Handmade Films in the 1980s to make ‘Water’, starring Billy Connolly, Michael Caine, Leonard Rossiter, Fulton Mackay and Valerie Perrine. Then the Berry cliffs were transformed into St Lucia, thanks to some fibreglass palm trees and an oil rig! It was such fun. During the winter we have done lots of improvements. We have cleared out the last remaining hellhole in the Abbey – it was the assistant housekeeper’s room during the War and had latterly been filled with junk! Mrs Stewart’s Room will house the Guernsey Literary and Potato Peel Pie Society display of filming at the Abbey in 2017. Unfortunately the ancient stone doorway is narrow and impossible to alter to accommodate wheelchairs but the main Film Exhibition is accessible. Theresa, Peter and Kieran have assembled a fascinating exhibit – ‘A Victorian Honeymoon’ – taking excerpts from the beautifully illustrated diary of their European tour in 1879 by my husband’s great uncle and aunt. It should be on show by late April. We have smart new windows at Blackpool Mill replacing the rotten and draughty, particularly in the bathroom! 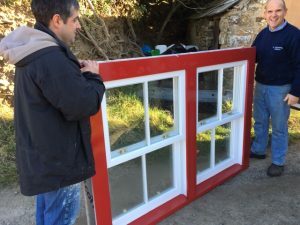 Beautifully made by David Chapple in Witheridge and put in by Richard Johns of Hartland, they are a huge improvement, making the cottage really warm. Blackpool Mill is a never ending maintenance headache, being so close to the Atlantic with its salty air causing most things to rust and rot in no time! During the winter we have laid new tarmac in the Front Drive, originally a carriage drive. It is so smart now and less bumpy. For those who cannot walk to the Walled Gardens via the Ladies Walk, this will also be an easier alternative and heaven for prams and wheelchairs! Everyone puts their hands to work frantically trying to get ready for opening and making everywhere as tidy and smart as we can. My job is to do all the marketing, create a new leaflet, keep the website up to date, repair lampshades and deadhead hundreds of hydrangeas. 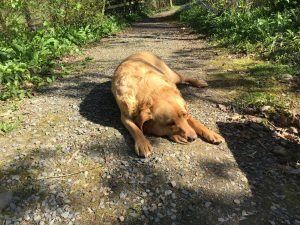 My husband is a very good deadheader too; the dogs love it and pootle around The Shrubbery but mostly go to sleep while we work! 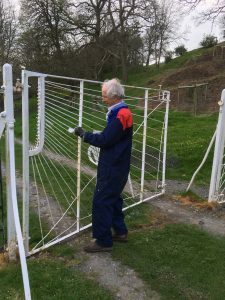 He is also Chief-Painter-of-Gates, a very responsible job as the gates need painting every year because of the salt air! 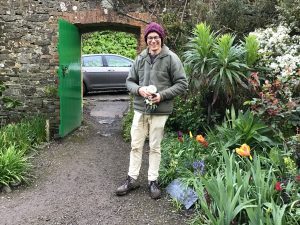 Thomas, our eldest grandson, in his gap year and about to go to New Zealand to work on a farm, has been clearing out a lot of dead wood under the big old rhododendrons to let the light back in. Leighton has done an amazing job renewing the gents loos which were finished just in time for Daffodil Sunday. He is Chief-Mender-of–the-Roof, an invaluable job stopping the leaks. Leighton has been with us since he was 15 and employed by my father in law as a butler! He is past retiring age now but comes in three days a week, Richard taking on the other two days. Leighton sells logs locally from all our storm damaged trees which inevitably come down from time to time. 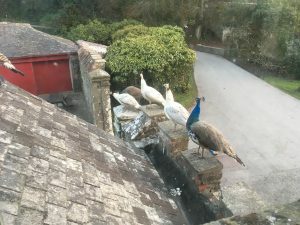 There is nothing he can’t do and has been responsible for keeping the Abbey and the holiday cottages going for ever. We are so grateful to him. He is also a great musician and singer of sea shanties, just like The Fishermen’s Friends! Carol has spring cleaned the Abbey from top to toe – it is gleaming! 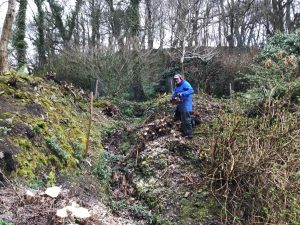 Dave has kept the grass under control and generally tried to keep the place tidy – not easy with the ever-increasing winter gales from the Atlantic bringing down branches everywhere. 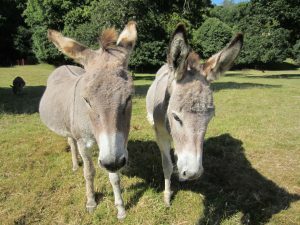 But he has now got two new mowing machines which really help him having struggled with ancient ones for ages! 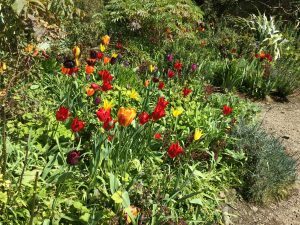 Nigel has got the Walled Gardens looking so lovely for spring – the tulips and the narcissi ‘Geranium’ together look beautiful. 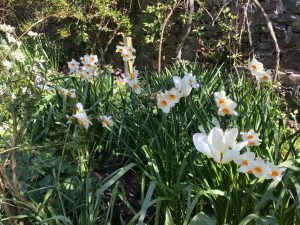 The Bog Garden started in January with wonderful mimosa and camellias and now, in April, the magnolias and the myrtles are filling the air with scent. 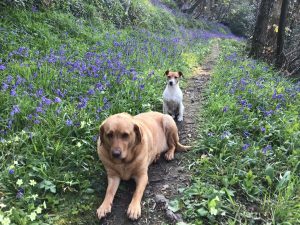 Primroses, bluebells, violets and wild garlic are everywhere. 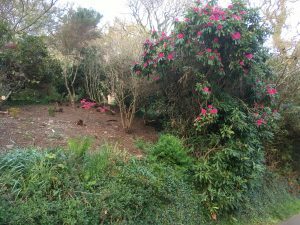 We have cleared old ponticum rhododendrons at the entrance to the Bog Garden and replanted with azaleas, enkianthus and myrtle which will love the south facing but dampish site. The Glade’ replanted in the Shrubbery last year is going to be a glorious place to relax in the semi shade surrounded by sweet smelling deciduous azaleas in spring. A distant cousin, Richard Granville, came to lunch to deliver copies of his excellent book on the Grenville and Granville portraits, at least six of which hang in the Abbey. My husband’s great grandmother, Louisa Granville, brought some of the portraits with her on her marriage to Sir George Stucley. All the portraits are of Sir Richard Grenville’s descendants and are of great historic interest. No trip to Hartland Abbey is complete without visiting Hartland Quay, only a mile away! It is a great place to stay for visiting the Abbey or combining with our theatre evenings. Perched on the side of a cliff overlooking the Atlantic ocean to Lundy Island, it has comfortable bedrooms and a characterful bar serving good bar food. We hope to see lots of Bluebell Sunday visitors on 14th April and keen Easter Eggers on Easter Sunday and Monday. It is fun for families to answer the riddles on the way to the Easter Eggs and all children are winners! We are open on Good Friday too. Many congratulations to Amy and Sam on the birth of their son! Sam helps Nigel in the gardens and is a vital cog in our wheel and Sam and Amy together provide their delicious, very popular barbecues for our open-air theatre performances during the summer months. We have lots of great shows coming up – Jane Eyre starts the season. Gangsta Granny will be very popular but all the shows, brought to us by travelling theatre companies and booked by The Plough Arts Centre, are a lovely way to spend a summer afternoon or evening. 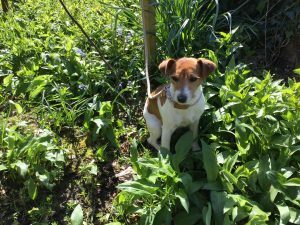 Rosie watching us work too! Finally, some of the Peas going to bed! What a difference the sun makes..